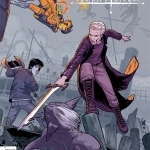 Whether the fight takes place in the future or the past, the Scooby Gang has to gear up for the coming battle. Will their actions will change the destined outcomes for the better, or will they make it worse? Whatever the result, they’re all-in and hoping to survive. It’s the only way. 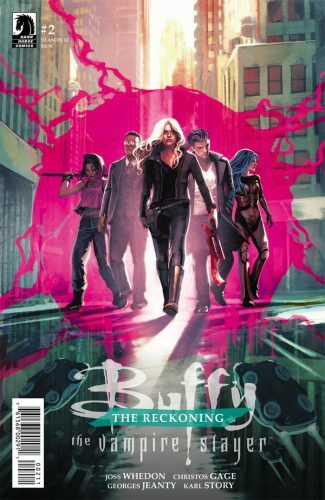 Almost immediately as we start the issue, Current!Buffy and Fray are engaged in a fight. Though, we saw it coming based on where we left them the last issue. 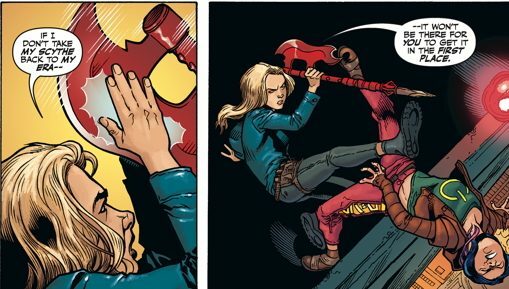 Thankfully, though, Fray is quickly convinced that fighting alongside Buffy is a better move since they have a common enemy. Harth is threatening all of their existences and must be stopped. To learn how to defeat Harth in their time, they must learn what the history books recorded about the outcomes. They find some leads in Fray’s library, where Giles reads about how the Watchers fell on hard times and there was an immortal madwoman who Buffy battled — a semi-dark Willow. But the books cannot provide as much as a living witness, and that’s soon what they get thanks to one of Gunther’s contacts. He knows another immortal, “The Queen,” and she is someone Buffy and the others know quite well. Of course “The Queen” is Harmony. She is someone that can survive death and destruction and still come out with wealth and power. Though, she does place the blame of how to world turned out upon Buffy and Willow’s shoulders. Their attempts to unite Slayers and teach Wiccans caused an anti-group of demons and vampires to arise. During the battle, all the Slayers except Buffy lost their powers and memories of being Slayers. 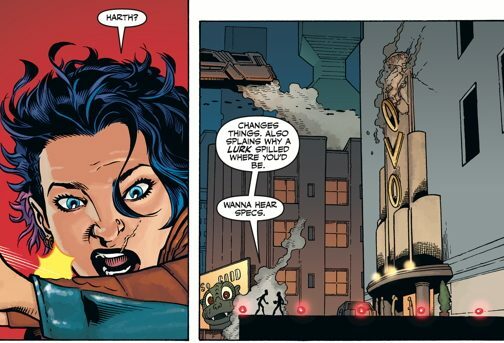 That placed Buffy, once again, in the position of saving the world on her own, with some back-up from her closest friends and family. With one opened portal to a Hell dimension and all the monsters sent through, it was up to Buffy to stand guard in Hell and make sure the monsters did not return. A sad fate to befall her, but one that was destined. And it’s not like the others who were left behind had an easy time of it either. Spike, Angel, and Illyria were never heard from again, so their fates were unknown. Dawn and Xander lived a relatively normal life in Buffy’s absence, but her presence was still felt. Giles and Willow continued to stand guard on this side of the portal, making sure it stayed closed, and the latter’s sanity was sacrificed for her mission. It’s not a hopeful future for anyone, but perhaps they can change it if they stop Harth. But how? Illyria could stay in the future and take on Harth once he returns, powered-up, but Angel wants to bring the fight back to their time. With Fray, Erin, and Gates in tow, they must take on an enemy who knows the outcomes before they do. Will they manage to come up with a plan he doesn’t see coming? That’s unknown, but I do feel sure that they’ll put up a good fight regardless. Let’s hope their future doesn’t turn out as dark as the one they visited.